This is a safari that show cases a full mix of Uganda’s cultures wildlife and the jungle from Kidepo valley national park to Bwindi. Through this trip, you can be sure to find large herds of savannah wildlife, the gorillas, chimps, Rhinos in extended expanses of their natural habitat. 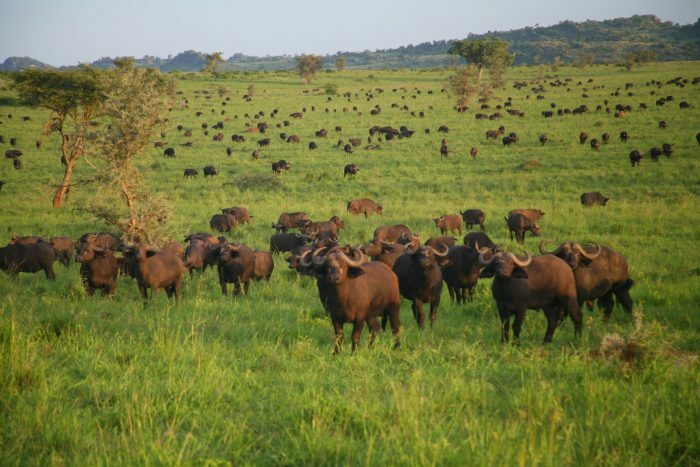 The 17 days safari covers five national park, two wildlife reserve and several cultural hotspots of Uganda. The trip starts from the capital Kampala (central) to Kidepo (north eastern border) and then to Bwindi impenetrable forest (south western border). The trip also leads to rarely visited places like Budongo forest home to chimps and Ziwa rhino and wildlife sanctuary. The only place you can find rhinos in the wild while in Uganda. This trip further exposes the traveler to the ethnic groups of Uganda alongside their neighboring natural heritage. You will be able to meet some of the least known remote tribes of Uganda with chances of participating in their authentic experiences. These tribes include the Ik tribe on Mount Morungule in Kidepo Valley national park, the Bakonzo tribe in Rwenzori Mountains of the moon and the Batwa living with the gorillas in Bwindi forest. At Lake Bunyonyi you will have a relaxed climax to this trip before you can return to Kampala flying with the scenic views of Kigezi region. Day 1: Kampala – Ziwa Rhino and wildlife sanctuary: Early morning, after breakfast, start the journey to Ziwa Rhino and wildlife sanctuary. The sanctuary is the only place you will find Rhinos in their natural habitat while in Uganda. The sanctuary was created to reintroduce the Rhinos after all were poached may years back. On arrival at the sanctuary embark on the rhino tracking experience that will take about 2 hours. Optional activities include the shoebill canoe trek and other nature walks. You will spend the first night here. Day 2: Drive from Ziwa Sanctuary to Kitgum: From Ziwa continue your drive towards Kidepo valley national park, spending the second night at Kitgum. In today’s journey, you will cross the Nile at Karuma falls then drive north through the relatively flat and remote Ugandan countryside. You will have several stop over points for snacks. As you travel. You will observe the changing lifestyles and architecture while you cross the different ethnic territories of Uganda. Preferably, carry some packed snacks to minimize relying on roadside eats. You may stop to grab cooked snacks or stop for lunch at Gulu town then proceed to Kitgum for dinner and overnight. Please note that no pictures allowed at Karuma falls bridge but the panoramic views of the Nile are worthwhile. Day 3: Kitgum – Kidepo valley National park: After breakfast, head to Karenga, on your way to Lokumoit Gate as your entry to Kidepo valley national park. Today, as you head to the park offices and after checking in, you will take the chances of spotting wildlife in this rich ecosystem. Common site is the breath taking scenery of the landscape and wildlife including cats, African Elephants, Leopard, Bush bucks, Giraffes, African Buffaloes and much more. On a lucky day, you may spot the lions typical of Kidepo on the rocks at the entrance of Apoka park headquarters or along the Narus valley. Day 4: Kidepo valley national park: Today you have a full day of exploring Kidepo Valley National park in a series of activities including game drives, nature and cultural walks, hot springs visits mixed with relaxing moments to enjoy the unique scenery of Kidepo landscape. Start with an early morning breakfast and packed lunch before you start the game drives and walks to the hot springs via the palm trees lined along Kidepo River, in search for Ostriches and leopards, tortoises along the way. You may choose to participate in the guided nature walk, mountain trekking to visit the Ik tribe chiefdom to participate in their dances and other cultural activities. You will then return to your hotel later in the day. Day 5: Kidepo national park – Gulu: After breakfast connect from Kidepo valley national park to Kitgum through Karenga. You will then have lunch in Kitgum before you continue to Gulu town. When in Gulu, You may participate in some cultural experiences to take a glimpse of the memories and remains of the Lord’s resistance army (LRA) war. You will be amazed to learn how this town has recovered to overturn the recorded story of horror. Being the largest town in the region, you will have chances to make refill shopping then return to your hotel for dinner and overnight. Day 6: Gulu – Murchison falls national park: Take an early breakfast and depart to Murchison falls national park. You will reach Murchison in the mid-morning and take a chance to do the game drive as you head to your accommodation at red chili hide way. This afternoon, you may join a boat cruise on the Nile for game viewing at a close range with options of taking a trek to the top of the falls. Please note that, taking the trek to the top of the falls requires that you have a car waiting for you at the top, to transfer you to the hotel. Day 7: Murchison falls National park: After an early morning breakfast; embark on a half day game drive on the northern bank of the river Nile. Game in this area includes Giraffe, Elephant, Harte beest, Lion, Uganda Kob, Oribi and a variety of savannah and woodland birds. Return to the Lodge and have lunch. If you didn’t take the boat cruise yesterday, after lunch, is the best time for a boat cruise along the river Nile for game viewing at a close range. This is a paradise of the Hippo and Crocodiles. Retire for Dinner and overnight. Day 8: Murchison falls – Budongo – Boomu women’s campsite: Early morning, transfer to Kaniyo pabidi in Budongo central forest reserve to do the chimp tracking. After spending good time with the chimps in their natural habitat, head out of the park to Boomu camp for dinner and overnight. Other options to do in the forest include birding tours and forest walks. Day 9: Boomu campsite – Rwenzori: After an early breakfast, transfer to Rwenzori Mountains national park. While at the Rwenzori Mountains of the moon, the community will take you through their life style in the hill. The journey to Rwenzori Mountains goes through Masindi – Hoima–fort portal road. From fort portal, you head south to Kasese, to the Rwenzori foothills Arrive at Ruboni community camp in time for Dinner. Day 10: Rwenzori: Wake up for early breakfast and head to one of the activities. Options include village walk. Forest walk or the community hill trek. You can choose to rest in the community as you meet the people while enjoying the local mountain setting. Day 11: Rwenzori – Queen Elizabeth: After a relaxed breakfast, transfer to Queen Elizabeth National Park. You may stop in Kasese to do refill shopping and lunch. You will arrive to a boat cruise on Kazinga channel to see herds of Buffalo, Hippo and other animals at the edge of the channel as they cool off. Depending on the season European migrant birds like the terns and gulls congregate here in large flocks. After the boat cruise, return to your accommodation for dinner and overnight. Day 12: Queen Elizabeth national park: After an early morning cup of tea at 6:30am, depart for a game drive on the northern parts of Queen Elizabeth national park, along the Kasenyi track. This is the best time for opportunities to view the cats in action. Later, return for breakfast. If you didn’t take the boat cruise yesterday, this is the best time for it. Optional activities include; participating in other wildlife safari activities or visit the Katwe traditional salt mining. Day 13: Queen Elizabeth – Bwindi Impenetrable national park: After an early breakfast, transfer to Bwindi Impenetrable National Park, the gorilla sanctuary through Ishasha sector. Since this route is inside the park, chances are you may spot some wildlife by the road. Common wildlife here include; elephants, baboons, antelopes, buffalos, birds and on a lucky day, some cats including the tree climbing lions. Day 14: Bwindi Gorilla tracking: After breakfast take your picnic lunch and headt to the briefing point. After briefing by park rangers, embark on a 30 minutes – 8 hours trek to find the Mountain gorillas. The tracking starts at the area where the gorillas spent the previous day/night. On sighting gorillas, you will be allowed a full hour with them. You then retire for dinner and overnight. Optional: For the energetic and basing on the time left, there is a possibility of a village guided walk to participate in some of the local community experiences. Day 15: Bwindi – Lake Bunyonyi: After breakfast this morning, you will be heading to Lake Bunyonyi. You will have lunch in in Kabale town then connect to the lake. Enjoy the relaxed boot ride to the island. You can opt for a local dugout canoe. On arrival, relax as you take the view of this hotspot gifted with the culture and some of the best views in the area. Day 16: Lake Bunyonyi: Explore Lake Bunyonyi area. This morning, you will take a boat over this magical lake to the mainland to visit the Batwa community. After participating in their activities, giving them the gifts and spending good time together, you return for lunch at the island, Optional activities include; birding tour around the lake to discover the little birds (“Bunyonyi”) or participating in one of the tours on the lake. This day is an opportunity to learn how the lake Bunyonyi has influenced the culture and the way it affects the life of a people to make them some of the most innovative in Uganda. Day 17: Lake Bunyonyi – Kampala: After the morning walk or a self-guided birding tour on the island you will come for breakfast as you take the photographic moment of the morning lake sunrise views. You will then head to Kampala via Kabale town. Arrive Mbarara town in time of lunch at Igongo cultural center. After lunch, head to Kampala with a possibility of stopping at the equator to buy some handicrafts and a coffee. Arrive Kampala in time of dinner and overnight in Kampala.